Free & thorough inspection of a roof for roof hail & storm damage. Can you imagine if a professional golfer was driving thousands of golf balls at your roof? That's a visual representation of how a hail storm can damage shingles and other roofing elements like gutters, skylights, vent hoods, flashing, etc. After a severe storm hits, a great question to ask is whether the storm caused any leaks that might damage the home's interior. Even without visible leaks, it's possible hail could still have damaged the roofing on the outside which is why it's really important to call in a professional roofer like Bone Dry Roofing to inspect the roofing for signs of hail damage - to help prevent larger issues down the road. Here at Bone Dry Roofing one of our experts will inspect the whole roof, including its elements. We will look for any signs of hail damage and show you if we find any. Our teams have years and years of experience they bring to your home, to suggest the appropriate repairs needed for our area. Whether we suggest a roof repair or roofing replacement we will keep you looped in and show you what we found. After a storm, we're the experts to call! Hail damage can run the gamut from a cosmetic blemish to severe leaking. Over the years, the roofing industry has learned much more about the effects of hail on roofing and contractors and insurance inspectors alike have learned much more about how different kinds of roofing get damaged in different ways by hail. The hail damage can also vary considerably from house-to-house and the area it's located in. The reason for this is the wind that carries the hail. A glancing blow will do less damage than hail that impacts the roof at close to 90 degrees. Asphalt shingle hail damage: Shingles can have broken or cracked tabs, but the most common hail damage comes as crushed or dented granules. Shingles have granules that are on top of them, and during a hail storm or other weather, those granules are forced into the shingle mat material or dislodged entirely. Because the granules protect the shingle from UV degradation, the hail dents can result in shortened shingle life. This damage usually qualifies the homeowner for an insurance claim. Wood shingle hail damage: Wood shingles can crack from hail impacts. Cracking will be along the grain and can cause parts of shingles to break loose. 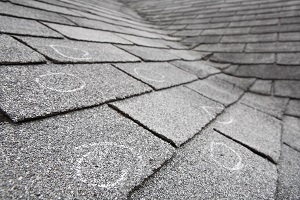 Slate roofing hail damage: Hail impacts can crack slates, although cracks tend to be more random than with wood shingles. Some slates may break loose from their fasteners and slide off the roof. Hail storm winds often cause damage to roofing that most people don't know about. The more extreme weather event often causes problems for homes and it is best to call your insurance agent to see if any repairs need to be made. Bone Dry Roofing is here to help you, no matter what Mother Nature throws at us here in the Greater Saint Louis area. As a local expert, we provide you with FREE inspections and estimates for hail damage repair in Saint Louis, Chesterfield, Saint Charles, Saint Peters, Florissant, O'Fallon, Belleville, Ballwin, Wentzville and throughout Greater Saint Louis. Contact us today!